If you are anything like me, you would venture into Costco and have seen that in the spring time they offer a Wavestorm paddle board package. My first question in my mind was if they are any good? That was the big question and I am sure many of the readers here as well. So let go deeper and I will tell you about my experience so that it might help you out in making a decision. I had noticed that my best friend had bought one as well as his brother and wife, so I knew they were a popular buy especially at the price with everything included. I decided to borrow my best friends to see if it was worth the money as I was concerned with it being cheap quality due to the low price (which is the case with a lot of things). I grabbed his board and headed to our local lake to give it a shot. It was a little windy on the day I went out, but I am fairly stubborn so that wasn’t going to stop me. My first impression was that is was visually appealing and easy to carry around as they have a built in handle in the middle as you can see in the picture. Also, the top of the board is nice and padded with foam so it is soft on the feet yet still gives you a good amount of traction. Because it is a wider board, it had a lot of stability so I let me nieces try it as well and they had no problem staying balanced on it without ever having any paddle board experience. With the width and being a solid board vs an inflatable board, It didn’t blow around quite as easily in the wind as an inflatable paddle board would have. It comes with a leash, paddle and board bag making it nice as you don’t have to go out and buy all of these things separately. Seems to be quite durable as I wasn’t afraid to bang it around and jump on it fairly hard. Time will tell for that though. Really great price for what you get. 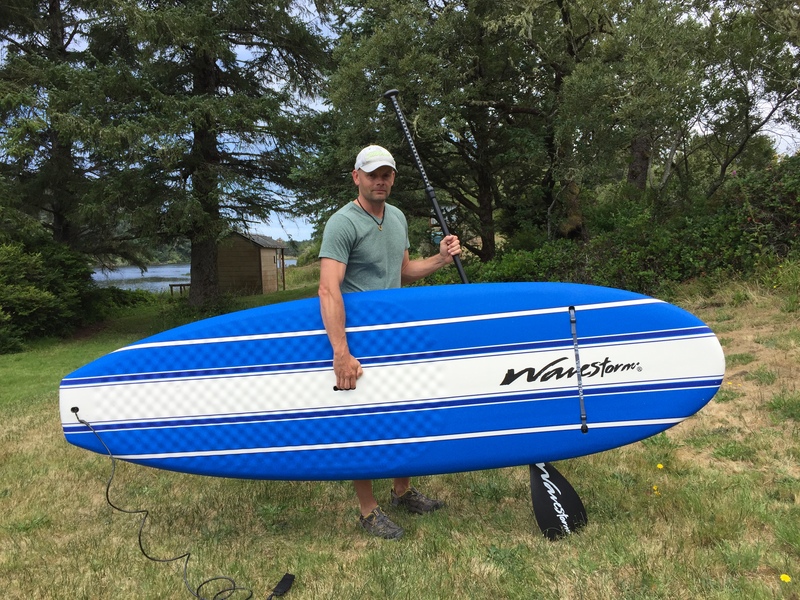 Great board for open, flat water enjoyment for just about anyone. The board bag, I really have no need for it and it is a pain to put on and take off. Amazon offers the same board, paddle, and leash without the bag. No color options that I know of. I wouldn’t mind being able to pic a different color. I like style. Only at Costco seasonal. Although that is why I offer them here through amazon for about the same price minus the board bag which I don’t use anyway. A little sluggish if you need to make a sharp, fast turn like in surfing. The board they sell at my local Costco is a 9’6″ that is rated for 250lbs and comes with the board, adjustable paddle, leash, and board bag. It is only offered in blue that I am aware of through Costco. I believe I paid $350.00 at my costco. ( they look to be $499.99 online now, so they have gone up in price.) We offer them on our site here through amazon for about the same just without the board bag and they sell out fast! In fact, as I am looking now, they aren’t even available at the moment, but keep checking back as the stock is adjusted daily. If your local Costco has them, that is probably an easier way to go honestly. We just wanted to give you the option in case they are out as well (especially in the winter time). Let me just say that for the money, this is a great board if you are just starting off or want a simple board that anyone can borrow or use. You won’t have to worry about anyone damaging it like an expensive fiberglass board and it is simple for anyone to learn on. That being said, if you are looking to paddle around in the ocean, I wouldn’t necessarily recommend this board. I am sure that it can be done, but I would prefer a longer, narrower board and maybe a fiberglass board for ocean paddling. Even for surf paddling, I would want something with a quicker response that can turn hard and fast. This is a little on the sluggish side in regards to turning on a dime. 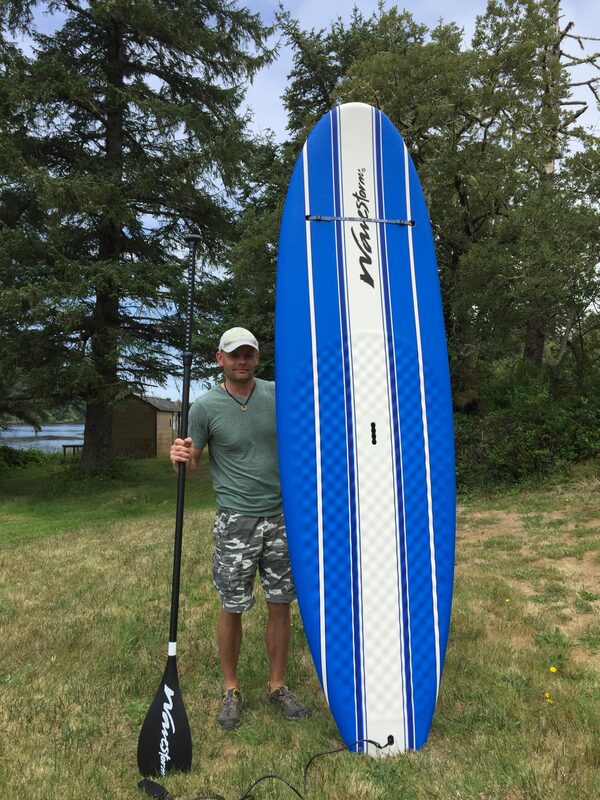 This board is designed for open, flat water paddling for beginner to intermediate boarders. For anything more than that, I would step up into a higher performance board. We have all kind of blogs and reviews on more performance oriented board in the reviews section. As for using this as a yoga paddleboard, I would say that it would work pretty good as it is wide, stable, and the full deck is padded as it is all foam. I really hope this helps you out if you were looking at or wondering about these boards. If you have any addition thoughts or questions, please post them below and I’d be happy to answer them or listen to your story. I have been checking a lot online to find a new source for these boards. I will keep availability updated as more come in. Please use the link below to check the current stock on Amazon. Thank you so much for reviewing the Costco boards! So helpful! Thanks for taking the time to read and comment John. Be sure to come back and let me know your thoughts after you have taken it out a few times.